BATES MOTEL finished out its debut season on a strong ratings note, averaging 2.7 million viewers in its first season, with 1.5 million viewers in both the 18-49 and 25-54 demos. Those results are the best any A&E drama has performed in the demos. 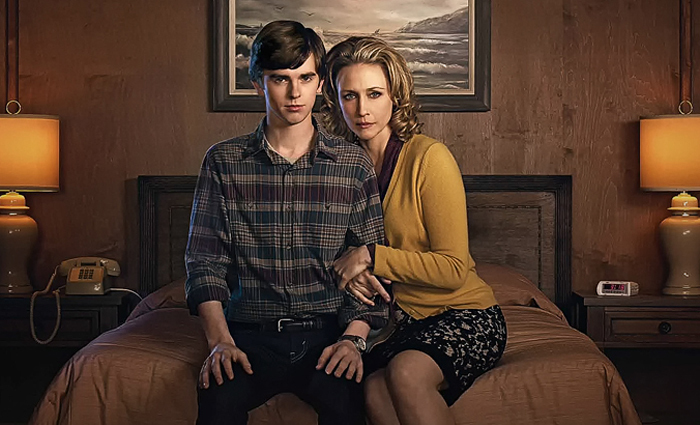 Though I’m still a few episodes behind, I think Bates Motel is the most surprising show on television, and I’m thrilled its been renewed for a second season. SHAPING SOUND, the dance company co-created by So You Think You Can Dance‘s Travis Wall and Nick Lazzarini and was featured on the Oxygen television show All the Right Moves, kicked off their tour last night in Los Angeles. I’ve got tickets for their June show at Town Hall in New York City and can’t wait to see them do their thing. VARIETY gave a rave review to Steven Soderbergh’s film Behind the Candelabra, airing on HBO this weekend. (Make special note of reviewer Peter Debruge’s use of the phrase “triangle shaped bikini tan.”) I can’t wait to see Michael Douglas and Matt Damon dig into the roles of Liberace and his lover Scott Thorson. Bring it on. HERE LIES LOVE, which I raved about last week, has extended again at The Public Theater. The show will now play through July 28. Tickets are available at The Public Theater’s website. Don’t miss it. Did you read anything interesting online today? Let me know! This entry was posted in General, Television, Theater and tagged Bates Motel, Behind the Candelabra, Here Lies Love, Matt Damon, Michael Douglas, Nick Lazzarini, Public Theater, Shaping Sound, Steven Soderbergh, Travis Wall. Bookmark the permalink.